My students are really into reading Guinness World Records books- I've come up with a way to have them read these and get some learning out of it at the same time! This is one of my favorite "punt" activities- where I can use it at any time and it's easy to pull together. It's also a great activity to leave for a substitute! If you don't have World Record books- they are easy to find at your local thrift store for super cheap. I have books all the way back to the year 2000- it doesn't matter which edition you have- the kids love them and they are all fascinating! The nice part about this assignment is that you can use any year record book (you could probably even use Ripley's as well!). 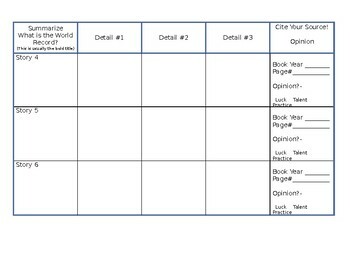 Just print out the sheets- they are double sided and hand out to students. This usually takes my students a class period to find all 6 stories- the book is fun to look at, so they have a hard time choosing which stories to write about! 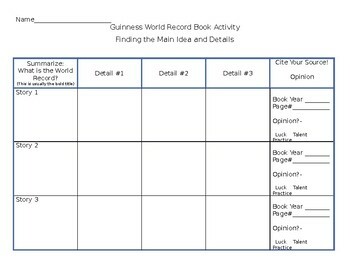 Students will write the title of each story- find 3 details- Cite their source (page number and book year) and say their opinion of the record- luck talent or practice (it can be all 3 sometimes!). Story- "Most Decks of Playing Cards Memorized"